Now that the Christmas season is upon us we’ve channelled our efforts and are going full throttle in preparation, turning the whole farm into a hive of activity. 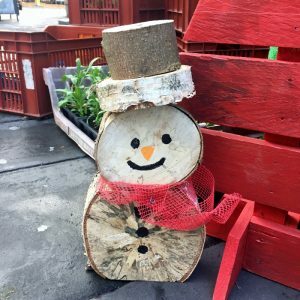 Splinters workshop has been busy making festive items to brighten up both home and garden, such as wooden snowmen and tree decorations, and the ornamental nursery has created some lovely gifts – which would make ideal stocking fillers – such as potpourri and handmade soaps. Blue spruce cut Christmas trees will be available from early December as well as smaller, growing Christmas trees in pots for those who want to see their tree grow over the coming years. 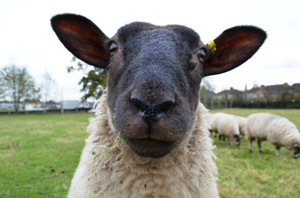 The market garden team will be cooking up a new range of jams and chutneys and we have gammon, sausage meat, and soon we’ll also have lamb boxes, to make any Christmas feast special. This year, for the first time, we’re running wreath making workshops in the plant nursery, with demonstration by a professional florist from Fishponds Flowers. This is an opportunity not to be missed if you fancy creating your own festive decorations and of course, no Yuletide event would be complete without a minced pie and some spiced apple juice to make it truly jolly. Spaces are limited so don’t delay in getting in touch to book your place. Another new line we’re introducing this year is our 2017 calendar and a selection of Christmas cards. We love the idea of sharing some of the wonderful moments that we’re lucky enough to see here on the Farm throughout the year. 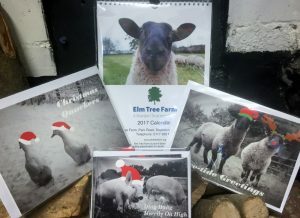 The humorous cards have been designed by staff at the Farm and are available in packs or as single cards. We’re particularly fond of our pair of Christmas quackers! With so many new products available we’re trying to make sure our customers have ample opportunity to shop with us, so as well as being open every weekday, our shop is now open on Saturdays, 9am-midday. From next week we’ll also be able to take credit/debit card payments, making it easier to pop in to browse and buy. Most of our products are also available in the Brandon charity shops too, so if you can’t make it to the Farm then pop into one of the shops on Whiteladies Road, Gloucester Road, and Cotham Hill. Don’t forget of course, that we’re at St Nicholas Market every Wednesday, as we have been every week for the past 15 years. 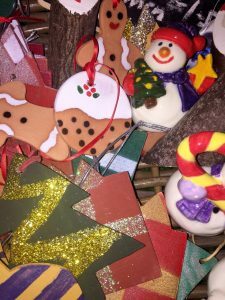 A few products from our sister enterprises are also available, such as ceramic tree decorations and made-to-order Christmas puddings. Take a look at our produce and price list to find out what’s currently available. One last thing, you may or may not know that recently we had our first ever Bonfire Night event here on the Farm, and it was a massive success! Admittedly we were a little nervous before the event as we didn’t know what to expect, but we were pleasantly surprised at how many people turned up to support us. 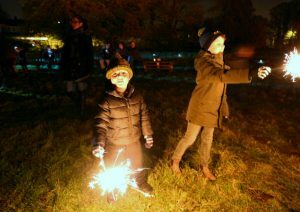 The atmosphere was fantastic with a glowing bonfire and sparkler fun. Marshmallow toasting for the children and mulled wine for the adults added to making it such a great evening, one which we hope to repeat next year. It also was a great way to mark the end of a very busy summer season and to get to meet many residents from our local community. We’d like to say a big thank you to everyone that came. I met Raymond one of your lovely people today while I was shopping in Fishponds. He was so friendly and polite. He told me about Elm Tree Farm and what goes on there. I will certainly act on his recommendation and visit to buy some eggs, look at the plants you may have for sale. He is a great ambassador!